These recipes are from an out-of-print cookbook by Rose Dosti called Middle Eastern Cooking. I have a tale to tell about the cookbook, but recipes first, then story. Combine all ingredients in a large glass bowl or jar. Mix well. Cover and marinate in the refrigerator for several hours before eating. Store in a container with a good-fitting lid for up to a month. These are irresistible! The flavor is bright and fresh: citrusy with just a hint of oregano. *I like cheap olives. I know: I’m a heathen. I used two cans of jumbo black, one can of large black, and a jar of colossal green… just plain ol’ grocery store brand. 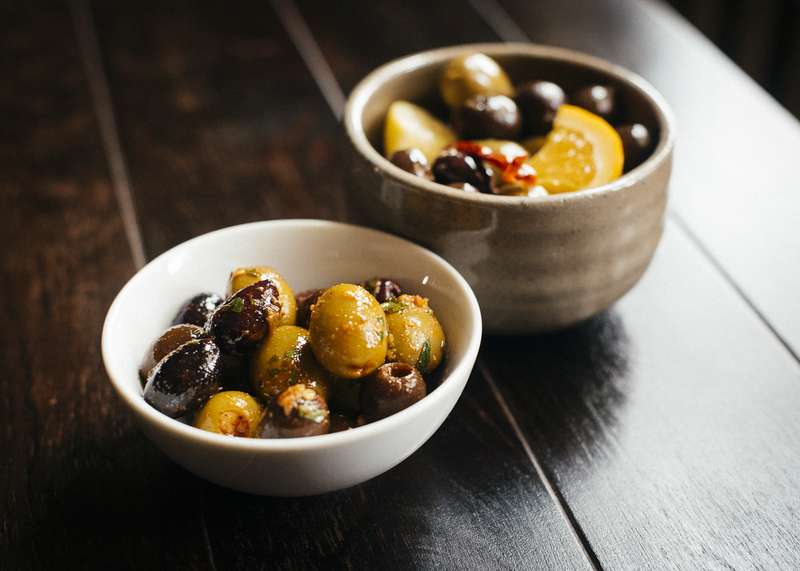 If you like good olives, go crazy and treat yourself; the directions remain the same. Combine all ingredients in a medium glass bowl or jar. Mix well. Cover and marinate in the refrigerator for two hours or overnight. Store in a container with a good-fitting lid for up to a month. These are earthy and spicy and garlicky-good. The marinade makes a delicious dressing for other salad-type things, too. I threw some chopped hearts of palm into the bowl today, and I bet some roasted red peppers or artichoke hearts or pepperoncini (or all three!) would be genius, too. So there you have it: two great tastes that taste great together. Or separately. Do what makes you happy. I made both recipes for Christmas Eve so I can go back and forth between the two bowls with a fancy toothpick. I didn’t have much mad money when I was a student at Syracuse University. My parents very generously paid for school and clothes and books and other essentials, and I had a work study job to keep me in beer and non-dining hall food that often paid me even when I didn’t show up ’cause I was too busy studying. I had plenty for which to be grateful, and I satisfied my book lust at the library. When I moved into my own apartment, I went through an Italian cooking phase that taught me how to make homemade pesto and tomato-basil-mozzarella salad… a Thai phase that required a trip to the Asian grocer for fresh lemongrass and other ingredients to make curry paste from scratch (My advice? Just buy the damn paste in a jar and make everything else yourself. )… and an “I should eat beans instead of meat” phase, based on the book The Brilliant Bean (which I just sold to Half-Price books… thank you, dino-chow). One trip to the library yielded Middle Eastern Cooking by Rose Dosti. My dad is part Lebanese, so I grew up eating hummus, stuffed grape leaves, kibbeh, and lamb kabobs. I had my dad’s recipes for all of those things written on index cards in my kitchen cabinet. Dosti’s cookbook was 192 pages of the best Greek, Arabic, Israeli, and North African recipes to round our my repertoire. I loved the cookbook so much, I was ready to buy it. But I couldn’t find the book in the local bookstore, and this was pre-Internet. When my dad came to visit one weekend, the two of us went to Kinko’s and photocopied the whole thing. It took a long time, and we chatted and laughed while we plunked the book down on the glass, over and over, oohing and aahing at each recipe, and playing the “You know how you could do that?” game. I bought a bright yellow cardboard expandable report cover, and that bootlegged cookbook traveled with me from Syracuse to an apartment in Escondido, California to a houseboat in Sausalito to an apartment in San Francisco, and finally, to a duplex and now our house here in Austin. Last year, I found a copy of the book on Amazon, but I couldn’t bear to toss the photocopied version. I just keep ’em both — side by side — on the bookshelf. I’ve made baba ghanoush and tahini dressing so many times, I don’t need the cookbook to make them anymore. But every few months, I pull out Middle Eastern Cooking… for spiced olives or a totally naughty Chicken Bastela (chicken, ground almonds, and cinnamon baked inside buttered philo dough and sprinkled with powdered sugar. I mean… really! )… and I remember my Dad and I, talking about nothing in particular while we broke several first amendment laws simply to hold onto some awesome, authentic recipes. If you enjoy the olives, you can thank my dad for teaching me to love a well-constructed recipe and food from the heart. I love this story! I can’t believe no one else commented on it. That is something I would do and the memory of that experience with your Dad is priceless. I’m going to look up that cookbook too. It sounds awesome! I’m so glad you commented! I love this story, too. It was such a nothing, lovely day my dad and I had together. And we still spend most of our conversations talking about food. It’s a delight. Thanks you so much for your sweet words! It is 5:45 AM, and I am awake because I had a low blood sugar attack of 55, so after getting something to eat, I decided to sit and look at your wonderful website for a while, and give my blood sugar time to stabilize. Little did I know that my eyes would soon be filled with tears and my heart with joy. I am getting ready to do my first Whole 30, and lately, I think because I keep thinking of all of the wonderful times I spent with my father as he cooked scrumptious meals and desserts while I learned at his side, I have been so painfully missing him. I did not realize why I have been so overwhelmingly melancholy until reading your beautiful story. Thank you for brightening my day, lifting my spirits and helping my daddy to give me a little nudge of love from Heaven. I have been off work since last November when severe pneumonia put me in the hospital for all of December and January; I am now home on oxygen, but when I am again well and allowed to return to work, I will be buying both of your books. I look forward to owning them and giving them a place of honor in my kitchen. PS. Steph is right . . . You do ROCK! I’m so sorry you had a blood sugar episode, but I’m very happy you found my site. I love that my post made you feel closer to your dad. It’s really special when my dad and I get in the kitchen; I’m glad you’ve had that experience with your dad, too. So sweet. I’m sending you many good vibes for continued recovery and am awesome Whole30. Be good to yourself and keep me posted on how you’re doing. I’ll be thinking of you. Thank you, Melissa! I appreciate your kind words about my relationship with my late father. He was an amazing father and the most honorable man I have ever known. My brothers and I were very blessed. Linda Ann, I just saw this and I know it was almost a year ago, but your comment made me burst into tears – in a good way! My family was lucky to have a great man and a helluva cook for a father too. Although it’s been 8 years ( my gosh…) since he passed, I still miss him Every.Single.Day. Also I hope you are feeling much better now!! Wonderful recipes, beautiful stories. Your website is changing my life and it really is the only place I have found and STAYED since beginning my first Whole30. Going into my second week and I feel AMAZING. I have made so many of your recipes and not ONE has disappointed. You, in a word, ROCK. You are so awesome to take the time to post this lovely compliment — thank you! I’m really glad you like my blog and recipes. I’m pretty sure YOU rock. I come back to your site time after time for great recipes!!! You have made dino-eating a real joy…Keep the recipes coming!!! You’re so nice… thank you! I’m really glad you like the recipes. I have to say, the Moroccan marinated olives are fantastic! I put them together for my weekly cook-up, and they were good Monday. But today, (Tuesday), they must have soaked up the spices better, and they were way off the charts! Thanks! This is one of my favorite recipes of all time. Glad you like it, too! You mentioned almond-flour crumbles but recipe followed. We’re can I find it? I’m sorry! I don’t understand your question. Can you be more specific? Melissa, I love the story of you and your dad. I have many fond memories of me and my dad in the kitchen (every Sunday was his kitchen day and he would put classical music on the record player and spend the entire day, after Mass of course, cooking Sunday dinner for me, my sisters and my mom. I remember being only a little taller than the kitchen table as he lined up all the spice jars for sauer braten, explaining each one as he put in in the big marinating bowl. And I especially remember him lining up the apples in the bottom crust of a double crust pie. Such a pretty sunburst pattern. My mom came into the kitchen and chided him, saying no one will know because the top crust will cover it. He calmly told her, “I’ll know”. All the mechanics of food comes to me from my mom, but the love, the passion, the passing on, from my dad. Thanks for your story; it brings back my dad for some wonderful moments. Oh, Monica! Thanks for sharing your “dad story,” too. I love his response “I’ll know” about the pie. That’s such a Jane Eyre-ian reply. Aren’t we lucky to have cooking memories with our dads!